3ft. by 5ft. polyester flag with white header and two grommets. Image is screen printed and appears on both sides. Anglo-Saxon Kingdom of Mercia. It was an independent Kingdom from 527â€“918. Today the flag flies over Tamworth Castle, the historical capital of Mercia. 3ft. by 5ft. polyester flag with a white header and two grommets. The image is screen printed and appears on both sides. The Kingdom of Northumbria. The Anglo-Saxon Kingdom that existed from 653-876. 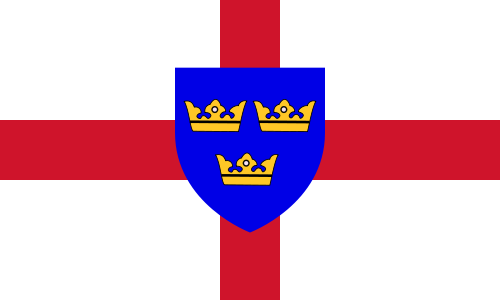 Today there is a modern county of Northumbria and has a flag based on this older design.